Probably Cinderella should be blamed for my love of shoes. I’ve always been convinced the right shoe could find me a Prince Charming. Alas, with a narrow foot, finding the right shoe isn’t that easy. Evidently, feet are a genetic thing. You either have your Mom or your Dad’s feet or a combination of the two. My 6’4” father wore a size 12. He was very handy when you needed to measure something, as his feet were exactly 12 inches long. He could literally “walk it off” for the correct measurement. Mom was an entirely different matter. She had very long feet for a 5’ 6” woman. She wore a 9½. If that wasn’t’ bad enough, she had extremely thin feet so she wore a Triple A. As any Neiman Marcus shoe salesman will tell you, a 9½ AAA is a freak of nature. You’d think I would have ended up somewhere in the middle, but this child was blessed with the smallest feet in the family. I was never petite, but at least my 8½ narrows made me feel that way. Of course all my girlfriends were wearing 7½’s but, I still felt like I had princess feet. 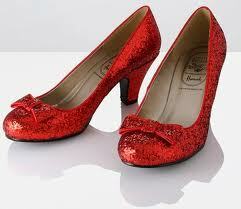 Unfortunately, Cinderella must have worn a size 7 medium because manufacturers don’t make narrow shoes anymore. Her princess slippers would have slipped off my skinny feet. Luckily I was raised by a woman with a nose for narrow shoes. She could sniff them out in any shoe store. Even luckier for me, she discovered all the 9½ AAA’s she could handle at Neiman Marcus. Seems Stanley’s daughter wore the same size. So I was raised at the sale rack in the Neiman Marcus shoe department. Yes, I am blessed and spoiled rotten. Actually attending every shoe sale at the downtown store with Mom was a learning experience. Sometimes we’d take her car, so I learned my way around one way streets and parking lots with attendants. Once she even valet parked. When we didn’t take the car, we’d take the bus. She wanted to teach me about buses, their routes and to have correct change. It’s funny how much I learned about transportation in the quest for shoes to walk in. There was more magic than just parking lots and buses. I experienced Neiman Marcus fortnights, saw the Queen’s jewels, ate at the Zodiac Room and learned seams match in all clothing sold at The Store. And then there were the shoes. My dresses, seams and shoes always matched. I’ll never forget the greatest bargain on earth – black and white spats to match my black and white dress. Somewhere along the line, shoes have lost some of their soul. Today you can buy any type of shoe you need at Wal-Mart. Problem is they only sell medium and wide. I walk right out of anything that big. When you live in the country, your need for a pair of Jimmy Choo 4 inch heels is replaced by the necessity of a pair of work boots that will keep fire ants off your toes. They don’t make narrow work boots. Luckily, I can wear two pairs of socks. My quest today is for shoes I can garden in that don’t’ slip off my feet. I wish Stanley’s daughter had been a gardener, too. Maybe I need to find a nice Prince Charming who owns a shoe store. He will fit me perfectly.